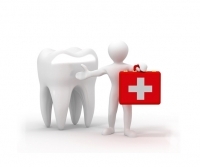 Emergency dental care is a term that describes any dental problem needing immediate attention. Each dental emergency may not necessarily include pain; however, pain is generally the first symptom to raise a red flag. Our emergency dentist will work to quickly locate the cause of pain. This may be due to a problem related to oral tissue, gums, or a tooth. After locating the source of pain, they will look at their treatment options for the patient as every dental problem has a different solution. For instance, treating one type of tissue may differ entirely from other tissues. Usually dental emergencies occur due to a bacterial infection or fungal infection. These infections are very severe and make patients very uncomfortable. Other than these infections, broken or chipped teeth can also be reason to call our emergency dentist. Treatment of one type of dental problem depends entirely on the severity and condition of the issue. Generally, tooth tissue loss is considered a dental emergency of high priority. Additionally, if a patient had a dental treatment in the past and it is falling out of place (filling and other similar treatments), this must also be tended to like an dental emergency. These issues can cause problems in eating, conversing, and other daily tasks. Treating dental emergencies in an absence of a professional may cause severe problems in the future. Therefore, patients must contact an experienced emergency dentist. At Shifa Dental, we treat every situation as a high priority. We have a team of emergency dentists who devote all their time in dental emergencies. Analyzing the situation before acting on it is our mantra. This eliminates the risk of any future complications for the patient. We have a perfect record of efficient, consistent, and accurate treatment of patients in cases of dental emergencies. If you need emergency dental care, contact our dentist office as quickly as you can.